Though times have definitely changed from the ’50s and ’60s, the automotive world continues to be predominately run by men, and that’s certainly the case when talking about the lifted truck scene in general. But don’t tell the queen of KEG Media, Ms. Keena Bryant that she doesn’t belong in the Lift’d world because she’ll leave you looking like a fool when all 4 feet 11 inches of her steps into her lifted Toyota Tundra and shows you how exactly it’s done! Now being married to the famed Mr. KEG Media, you might think that Keena just sat back and let her husband come up with the design of the truck, but you’d be completely wrong. In fact, Keena was involved in every bit of the design process, from guiding Robbie in the rendering phase to reaching out to companies that didn’t yet make products for her truck of choice and getting them to come on board with the build. That’s right, this lady knew what she wanted in a custom truck of her own and she completely took the reigns in making it happen. 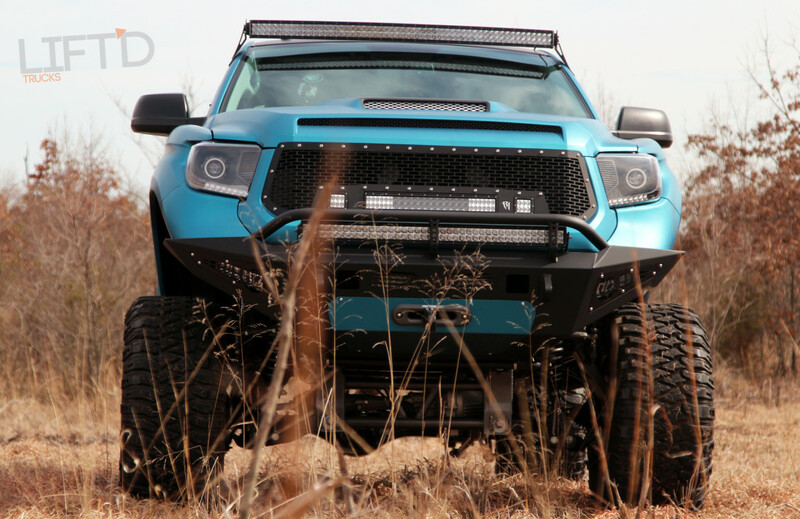 Just like all incredible and detailed builds, creating Keena’s truck was a process, one which started with an affinity for the new Toyota Tundras. 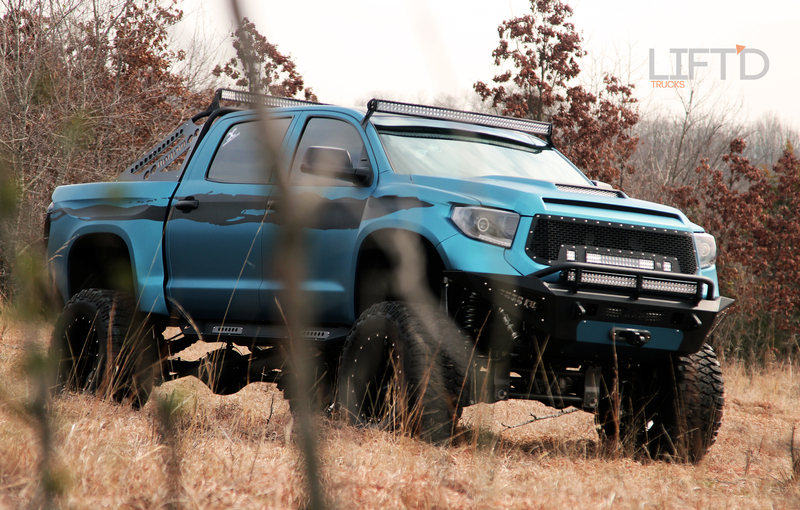 Upon selecting the base of her project, Keena left no stone unturned, thinking of just about everything you could imagine to put on a killer lifted truck build and then how it would all tie together in perfect harmony. 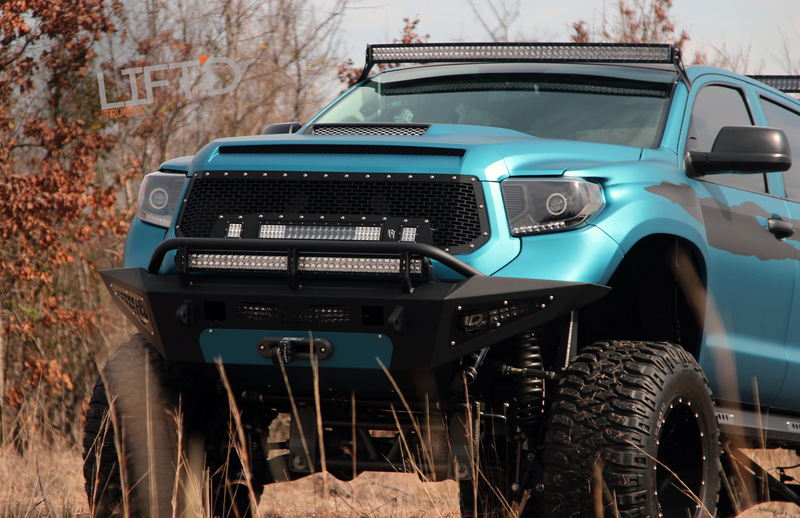 This included Addictive Desert Designs’ Honey Badger bumpers; the only problem was that ADD didn’t make the Honey Badger line to fit the new Tundra. That, of course, all changed with a little convincing from Keena herself. After obtaining the truck, it was sent directly to ADD from Arkansas where the Bryants live to ADD’s home base in Mesa, Arizona. 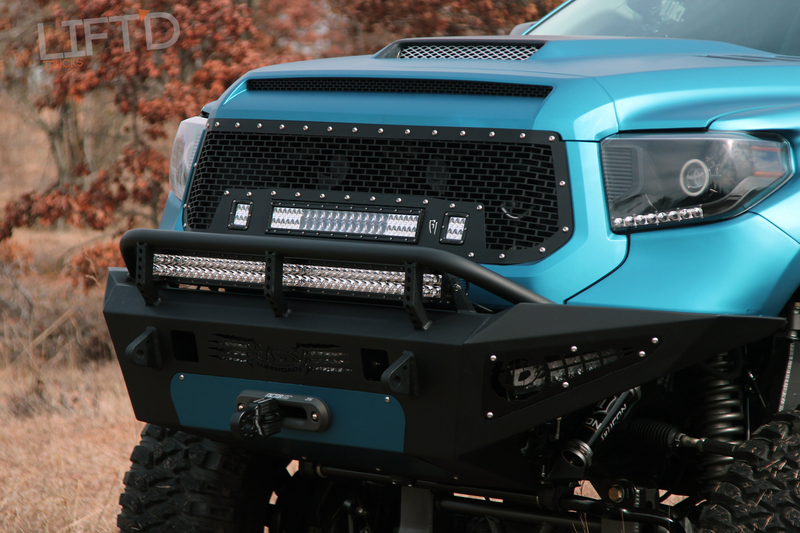 There, the ADD crew used Keena’s truck to conceptualize, build prototypes and produce the very first Honey Badger bumpers for the new Tundra. 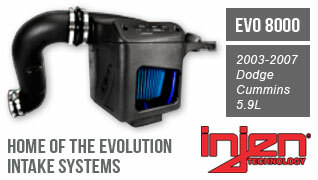 In addition to the new bumpers, the truck also added in the production of ADD’s Chase Rack and side steps for the truck model. After its formal fitting, the truck was sent off to Complete Customs in McKinney, TX where the next part of the build took place. 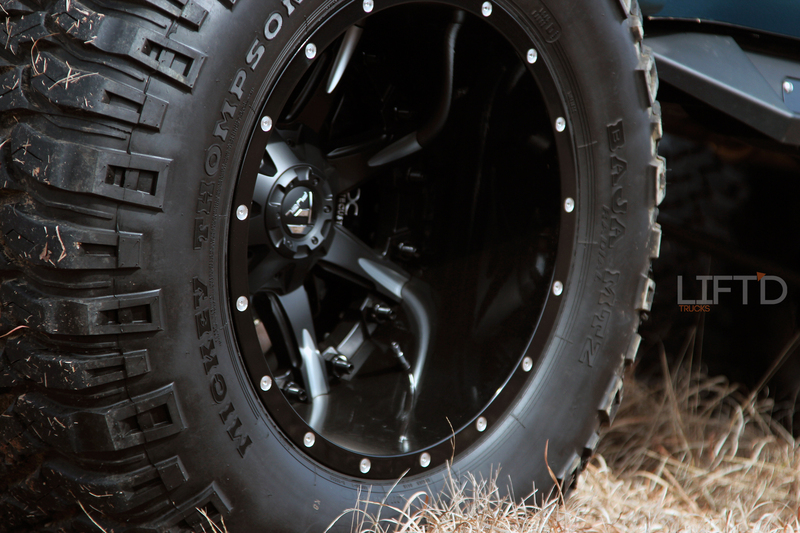 Once in Texas, the truck underwent the next step in its complete makeover – the addition of McNeil Racing fiberglass fenders and bedsides, one of the Bryants’ favorite additions to the truck. 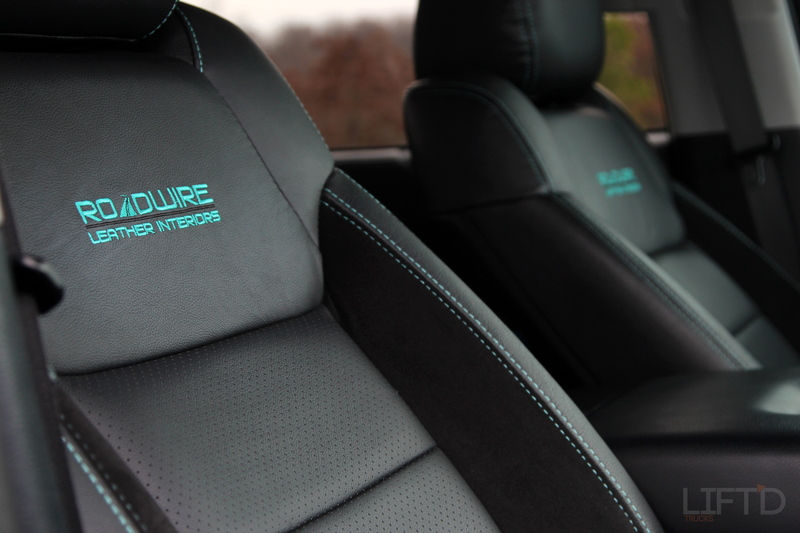 The Black and Teal Roadwire leather interior was also installed at the same time, setting the stylistic standard for what was next to come. 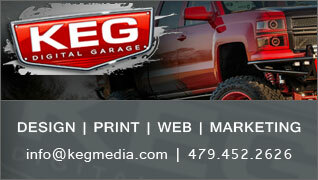 From McKinney, the truck was sent to Fort Worth where Tyler of BSG Wraps laid the truck’s telltale color scheme. 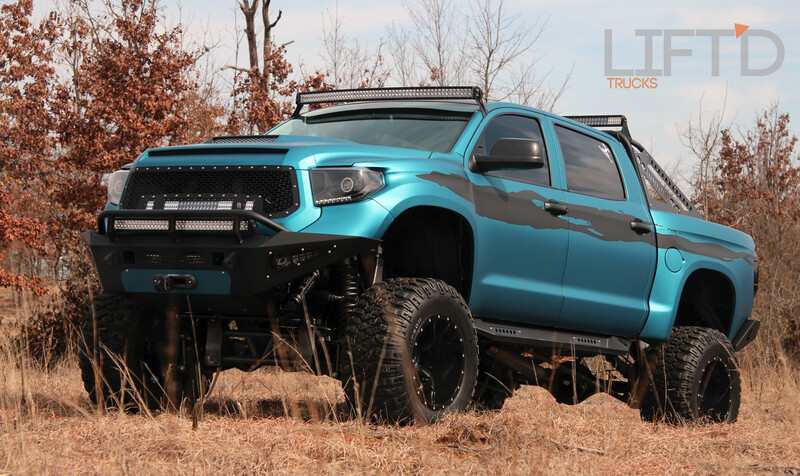 Though not a typical color found in the lifted truck world, Keena wanted a teal color for her truck. After scouring book after book and sample after sample, the Avery Dennison Matte Lagoon Blue Metallic wrap was chosen and applied to the Tundra, sure to make the truck stand out among even the most unique lifted rides. After the truck was wrapped, it moved on to Odessa, TX, where the new Complete Customs of West Texas crew took over the rest of the build. 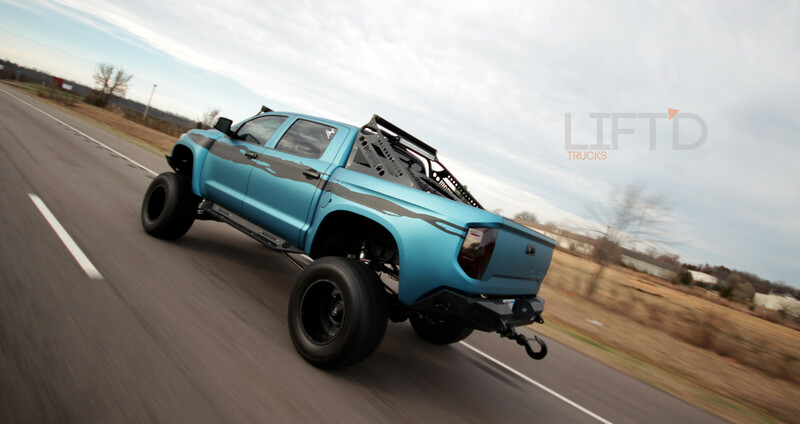 The West Texas crew did everything else there was to do on the truck, including fitting it with the Bulletproof 12-inch lift with Atlas Suspension 10-inch leafs, Icon Vehicle Dynamics coilovers in the front and resi-shocks in the rear. 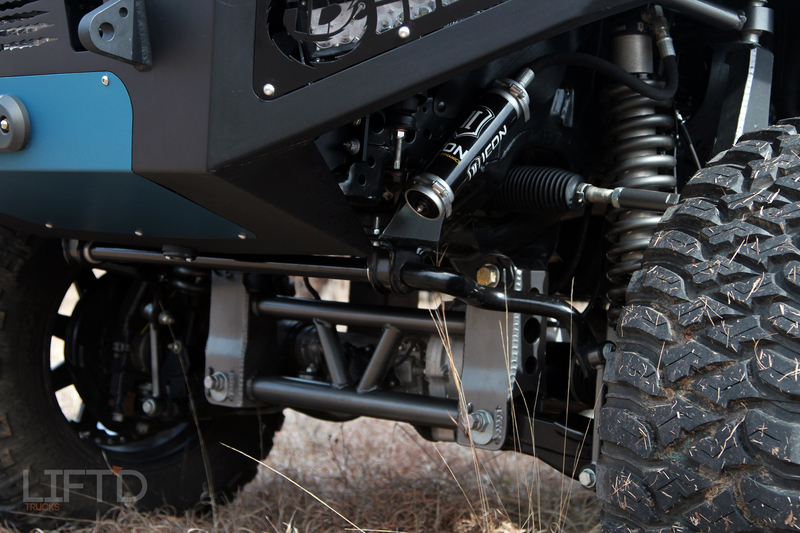 By the time the suspension modifications were well underway, Addictive Desert Designs sent the first set of official Honey Badger bumpers out to Complete Customs of West Texas, where they, as well as the Chase Rack, side steps and the truck’s immense amount of Rigid Industries lighting components were installed. 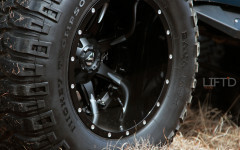 From there, it was a matter of mounting the 20-inch Fuel Off-Road Nutz wheels wrapped in Mickey Thompson Baja MTZs, spraying the Scorpion bedliner and doing a few performance upgrades to the engine. 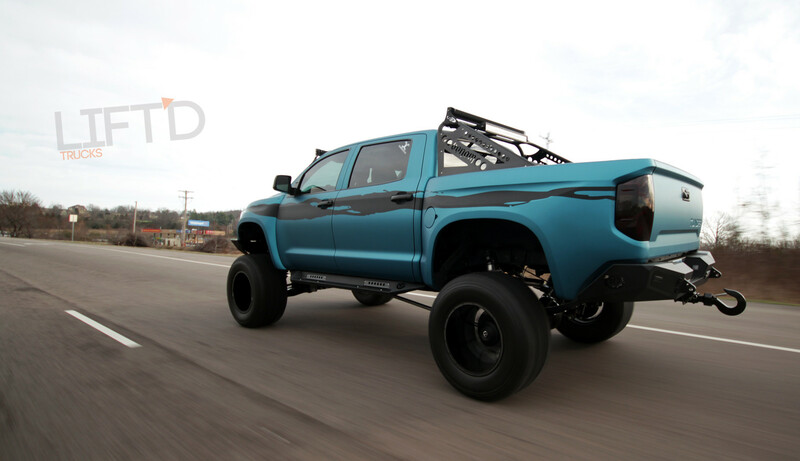 What is definitely one of the most aggressive Toyota Tundras we’ve seen on the road to date, Keena’s truck debuted at the 2014 SEMA Show, precisely where she wanted a build of her own to be showcased. Since then, the truck has gained national attention and fittingly found its way here for the official launch of Lift’d Trucks Mag. 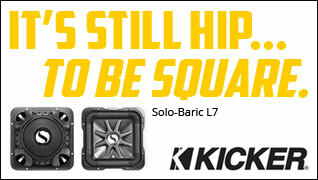 But don’t think this is the last you’ll see of Keena and her impeccable taste when it comes to Lift’d trucks. Rumor has it that she’s been working on yet another SEMA Show build for 2015 and it’s sure to blow the competition out of the water – and of course, we’ll have the scoop here so stay tuned!